The Newest Rant: Why Aren't More People Reading and Talking About the New, "Nighthawk," Comic? Why Aren't More People Reading and Talking About the New, "Nighthawk," Comic? Seriously, why are people not discussing this? I mean, I found the first issue decent but felt it could do more. Then, lo and behold, a superb second issue and equally stellar third come out. I will admit I understand this version of Nighthawk has a lot of baggage. First he was a Marvel Max character (in, "Supreme Power,") then via, "Secret Wars," he was brought into the Marvel Universe with a bunch of other survivors of alternate realities who currently have a really sub-par comic known as, "Squadron Supreme." 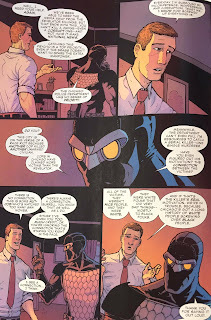 So yes, there is a lot going on with the character of Nighthawk, but the great thing with this comic is you really, really, don't need to know any of that. 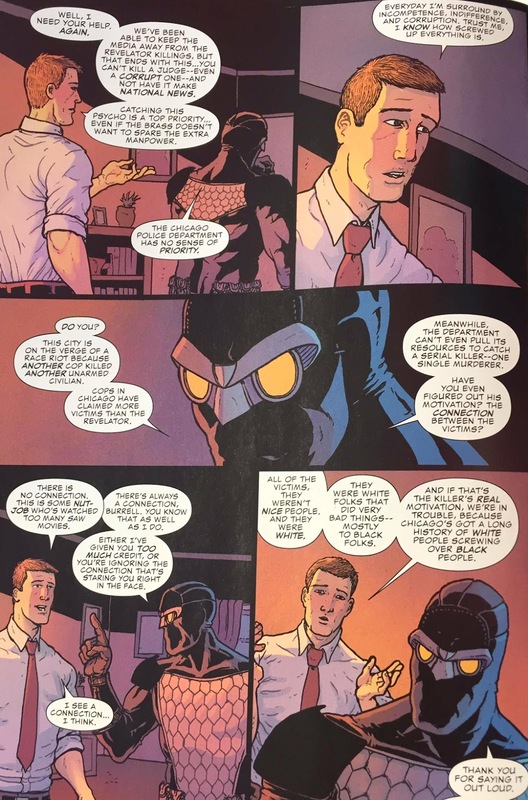 In this comic it is laid-out that Nighthawk is a crime fighter who is like Batman, but if Batman were eternally pissed-off because his parents were targeted by murderous racists. Besides that the rest is ancillary to the greatness of the, "Nighthawk," comic outside of when one character mentions how in his other team-focused comic he killed Namor. He's a billionaire in Chicago who protects the innocent via brutal means but with the twist that the establishment really hates him (unlike Batman who in most comics has a begrudging degree of respect with police, politicians, and so forth), so it isn't too imposing a comic to get into--please don't worry. The comic, "Nighthawk," has amazing writing by David Walker and beautiful artwork by Ramon Villalobos (who absolutely killed-it on the Secret Wars-related X-Men mini-series, "E is for Extinction,") and is jam-packed with action, tense plot, and all kinds of political commentary. 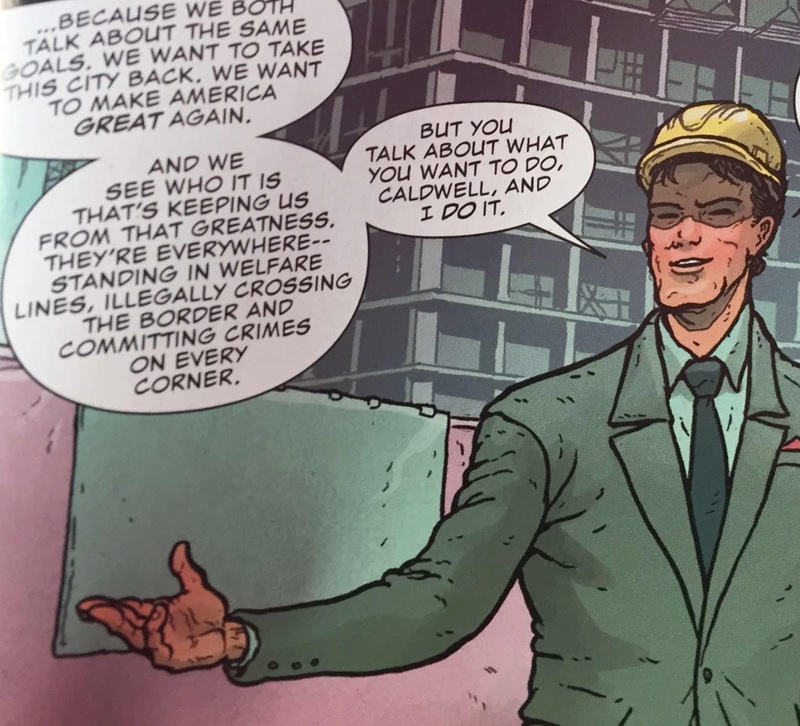 Kudos to Marvel for allowing this creative team the editorial freedom to have Nighthawk going up against a corrupt businessman who talks just like Donald Trump and literally says how he wants to, "Make America Great Again," in-between disparaging minorities. Nighthawk also beats-up corrupt cops who brutalize black citizens and otherwise is the kind of hero that would make Fox News froth at the mouth. 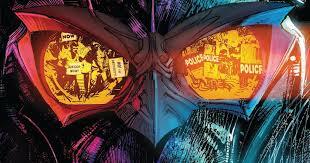 The thing is, Nighthawk doesn't hate cops, he just hates corrupt, terrible, and racist people. He works with someone on the police force who realizes that our hero wants to do more good than bad. 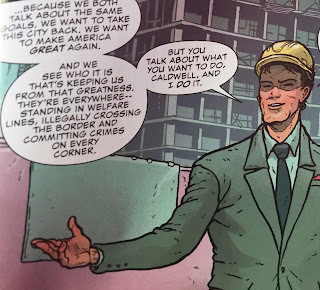 Plus, Nighthawk may be a more extreme Batman in that he won't hesitate to kill people, but he doesn't always purposely want to harm others, he just is willing to go farther in his goal of protecting the innocent (with the comic itself admitting he is maybe already going too far). this idea is further expressed by how there is a serial killer who is targeting exclusively white victims that had a history of hurting or killing anyone of color--and Nighthawk is worried that a serial killer on the loose in this manner doesn't upset him as much as it should. It just astonishes me that sometimes people say they want more, "Mature," super-hero comics that discuss grown-up issues, and here is one from a huge publisher getting far too little attention. It talks about racism, police brutality, gentrification, how our legal system is broken and mistreats people of color, and as I mentioned, looks really really good thanks to Villalobos. I am excited for when issue #4 comes out later this month and plan to continue following the comic closely--it is too good a read to miss out on! 5 out of 5 stars (for issues #2 and #3).